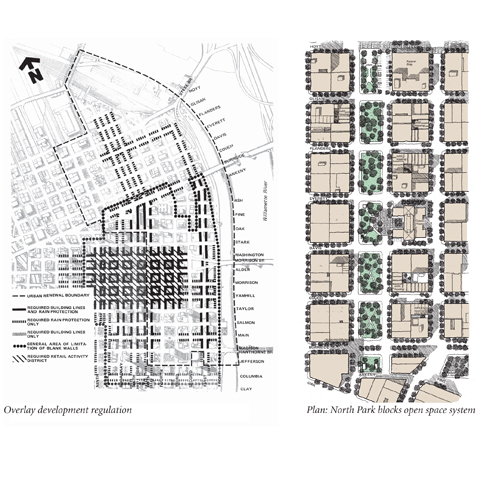 Dyett & Bhatia prepared zoning regulations for downtown Portland in the early 1980s, that are still largely in effect. These were intended to maintain the small-scale, high intensity character of downtown. Limitations were imposed on parking capacities and locations to implement the city’s policy of reducing air pollution and encouraging walking and transit use. Interruptions of retail frontage, blank walls, and setbacks that threaten the vitality of the retail core were regulated. Provisions for bonuses were incorporated to stimulate downtown housing development.